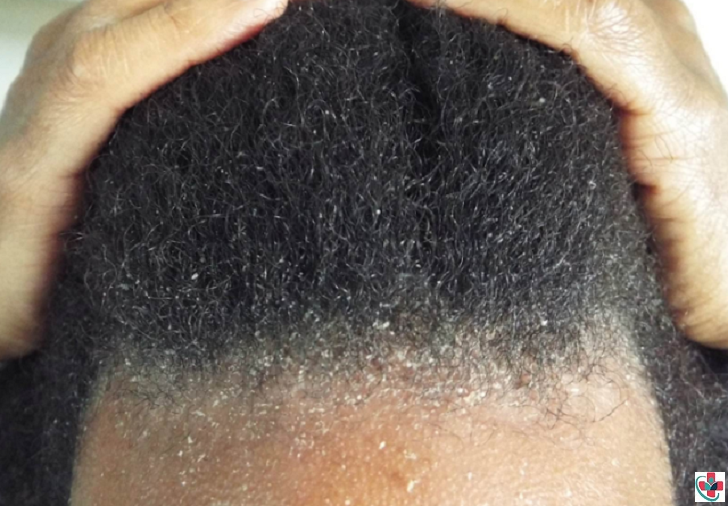 Seborrheic dermatitis (dandruff) is a common, inflammatory skin condition that causes flaky, white-to-yellowish scales to form on oily areas such as the scalp or inside the ear. It can occur with or without reddened skin. It is thought to be due to a combination of an over-production of skin oil and irritation from a yeast called malessizia. Seborrheic dermatitis appears to run in families. Stress, fatigue, weather extremes, oily skin, infrequent shampoos or skin cleaning, use of lotions that contain alcohol, skin disorders. Neurologic conditions, including Parkinson’s diseases, head injuries, and strokes, may be associated with seborrheic dermatitis. Human immunodeficiency virus (HIV) has also been linked to increased cases of seborrheic dermatitis. Aspirin contains the same active ingredient (salicylic acid) as many medicated dandruff shampoos. Keep flaking in check by crushing two aspirins to a fine powder and adding it to the normal amount of shampoo you use each time you wash your hair. Leave the mixture on your hair for 1-2 minutes, then rinse well and wash again with plain shampoo. Stop yourself from scratching by massaging aloe vera into your scalp before shampooing. The cooling effects of aloe vera will soothe the itch. Garlic's antimicrobial properties are perfect for eliminating dandruff-causing bacteria. Crush garlic and rub it into your scalp. To avoid that potent smell, healwithfood.org suggests mixing crushed garlic with honey and massaging into the scalp before washing as usual. An overnight olive oil soak is a folk remedy for dandruff. Massage about 10 drops into your scalp and cover with a shower cap overnight. Follow your regular shampoo routine in the morning. For a quicker cure, look for a shampoo that contains olive oil. Apply the oil of the soya bean over the scalp. Rub the oil on the avocado into the scalp. Grind some sesame leaves and mix the resulting paste with gingerly oil. Apply this to the scalp and rinse after ten minutes. Apply the powdered seeds on the scalp. After one hour, wash your scalp with fruit from the soap nut tree. Soak a handful of matured fruits in a bucket of water and use this water as a hair wash or natural shampoo. Your kitchen could hold the key to an itch-free, flake-free scalp. Wet your hair and then rub a handful of baking soda vigorously into your scalp. Skip the shampoo and go right to rinsing. Baking soda reduces overactive fungi that can cause dandruff. Your hair may get dried out at first, but after a few weeks, your scalp will start producing natural oils, leaving your hair softer and free of flakes. Dr. Mehmet Oz swears by apple cider vinegar as a dandruff treatment, as the acidity of apple cider vinegar changes the pH of your scalp, making it harder for the yeast to grow. Mix a quarter cup apple cider vinegar with a quarter cup water in a spray bottle and spritz on your scalp. Wrap your head in a towel and let sit for 15 minutes to an hour, then wash your hair as usual. Do this twice a week. To treat a bad case of dandruff, wash your hair with your regular shampoo, then rinse with an alcohol-based mouthwash. Follow with your regular conditioner. Mouthwash's anti-fungal properties help prevent dandruff-causing yeast from growing. Crunchybetty.com says coconut oil is a "tried and true" dandruff treatment, and it smells nice too. Before showering, massage 3-5 tablespoons of coconut oil into your scalp and let sit for about an hour. Shampoo normally. You can also look for a shampoo that already contains coconut oil. Dandruff relief may be no farther away than your refrigerator. Just massage 2 tablespoons lemon juice into your scalp and rinse with water. Then stir 1 teaspoon lemon juice into 1 cup water and rinse your hair with it. Repeat this daily until your dandruff disappears. Lemon's acidity helps balance the pH of your scalp, which helps keeps dandruff at bay. The abrasiveness of ordinary table salt works great for scrubbing out dandruff flakes before you shampoo. Grab a salt shaker and shake some salt onto your dry scalp. Then work it through your hair, giving your scalp a massage. You'll find you've worked out the dry, flaky skin and are ready for a shampoo. See your GP if your symptoms show no signs of improvement after using anti-dandruff shampoo for two weeks. You may require stronger prescription treatment. Your GP can examine your scalp to rule out skin conditions such as seborrhoeic dermatitis or psoriasis, which may also require prescription treatment. If your GP thinks a fungal infection may be present in your scalp (for example, scalp ringworm), a skin sample may be taken and sent to a laboratory for testing.